Fried potatoes = heaven. We mean that literally: we’re frying potato pancakes (aka latkes) for Channukah, the Festival of Lights and a Jewish holiday! It’s traditional to cook with oil to remember the miracles associated with the event being celebrated. Whether you’re observing Channukah (it starts Friday, December 11 at sundown), want to learn to make latkes for Jewish friends, or would like to try something new in the kitchen, read on about making and enjoying potato pancakes. Chances are that you already have all of the ingredients needed for latkes in your kitchen. Take two potatoes, scrubbed clean but not peeled, and shred them with the grater blade in the food processor. (Or grate them by hand.) We used white potatoes, but Russets work, too. Next, take one yellow onion, cut it in half lengthwise and then make ¼ inch slices with one half. Store the other half. 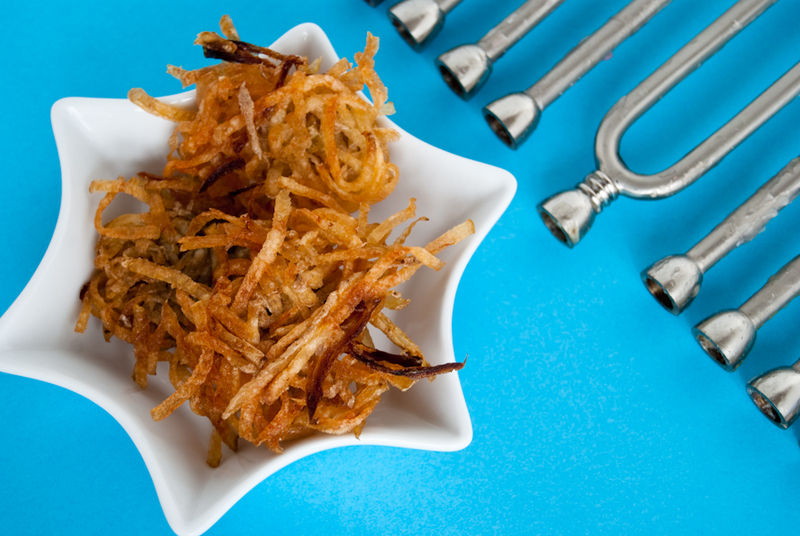 Place the sliced onion and shredded potatoes in cheesecloth with about a teaspoon of kosher salt. Let sit for a few minutes. While it sits, put a pan with about ½ inch of vegetable oil on the stovetop. A pan that heats evenly – such as cast iron – works best. Heat the oil on medium. Next, wring out the moisture from the potato/onion mix. This step is key to making the latkes super-crispy. Start making patties with the mix in the palm of your hands and then put them in the hot oil. Adjust the heat of the oil as needed. If the latkes are a bit loose, don’t worry, they’ll bond in the frying process. You can also add egg and/or flour to the latke mix to help them stick together. Once you see the edges of the latke getting brown, it’s time to flip them over. After a few minutes, check to see if they’re done. Transfer fried latkes to a plate covered with a paper towel to absorb the excess oil. Latkes are best enjoyed immediately after frying with applesauce and sour cream. If you’re making latkes for a crowd, the recipe can be doubled and latkes can be kept warm in the oven at 200 degrees Fahrenheit. Frying once in a while is fun and delicious, but consider that oil adds fat and calories. Opt for a vegetable oil that is higher in unsaturated fat, such as olive, canola, or soybean. Latkes can also be baked at 425 degrees on a lightly sprayed cookie sheet for about 30 minutes. Turn the latkes after the first 20 minutes. Baking is healthier than frying because you are saving fat and calories, but honestly, for a once a year special dish, the full flavor comes from frying! If calories are a major concern, use a fat free or low fat sour cream on the side, and serve with vegetables and lean protein. What do you serve on the side with your potato pancakes? How do you season them? Please share your ideas with other readers and enjoy this crispy treat! How Stacey Got the Shot: With the camera on the tripod, focal length 52mm, f/5.6 in 1/6 second, ISO 200. Hi there! Happy Hanukkah! I posted latkes too. Ah, yes, we can fry in oil, but we can also save some calories on the toppings, we are in agreement. I hope you have a wonderful festive holiday. P.S. Very cool shot of potatoes with menorah!